Does your patient need a transfusion? Safe and effective red cell transfusions are based on your knowledge of red cell antigens and antibodies. This knowledge also forms your understanding about the aetiology of haemolytic disease of the newborn and its clinical management. These are either carbohydrate or protein substances that trigger our immune system to produce antibodies. Antigens are found on the surface of red cells, white cells and platelets but are also found on body tissue, body fluids, and on surfaces of bacteria and viruses. Antigenic cellular blood elements and plasma proteins can result in alloimmunisation or the production of antibodies, specifically called alloantibodies, which are directed against the blood group antigens of another individual. The immune system's response to some of these antigens range from clinically benign to massive and complicated immune reactions, possibly resulting in death. These substances are produced by our body's immune system in response to an antigenic stimulus. 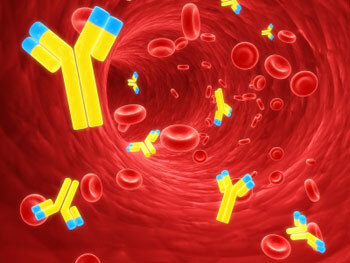 Antibodies or immunoglobulins (Ig) are made of gammaglobulins, consisting of five main types: IgG, IgM, IgA, IgD and IgE. Each type performs a different role. Almost all antibodies to red cells are IgG or IgM, and a minority have an IgA component. IgM antibodies are naturally occuring and may result from 'natural' exposure to substances within the environment or diet that have a similar structure to the corresponding red cell antigens. They are generally non-reactive at 37 °C and are therefore of little clinical significance, however IgM anti-A and anti-B are potent haemolysins and are capable of causing intravascular haemolysis by binding complement and are therefore classified as clinically significant antibodies. IgG antibodies are formed as a result of immunisation following exposure to foreign red cell antigens through transfusion of red cells or by fetal red cells leaking into maternal circulation during pregnancy. These IgG antibodies are reactive at 37 °C and are clinically significant because they are capable of mediating destruction or sequestration of transfused allogeneic red cells. They are known to cause haemolytic transfusion reactions or haemolytic disease of the fetus and newborn.